David Earle was installed as President for 16-17 at the recent changeover meeting attended by District Governor Richard Luke. 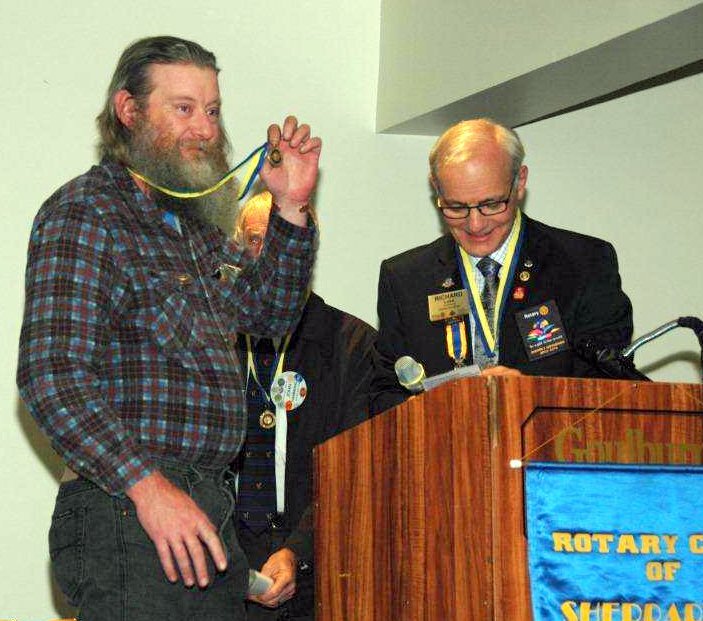 Rotarian Greg Barnes received the recognition of Paul Harris Fellow at the same meeting. Congratulations Greg for joining the PHF club. The Give-Me-Five-For Kids battery collection program, run by Paul Archer, has received a boost with our purchase of 16 signs to mark the locations where batteries can be left for collection. We welcome new members Marie Curtis-Geisler and Paul Archer. The Rotary Club of Shepparton South has awarded its highest honour: A Paul Harris Fellowship, to Rushworth resident and Shepparton businessman Paul Archer. Paul Archer has single handedly raised more than $140,000 for the “Give Me Five For Kids” appeal for GV Hospital. He has done that by collecting old auto batteries from local and regional businesses and individuals and selling them for recycling. Paul has established a network of auto repairers who stockpile the batteries for him. He uses his own Hilux and trailer to collect the batteries, and with the help of local metal traders and carriers, delivers them to the recyclers, with all proceeds going to the ‘Give Me Five For Kids’ appeal.